It's time for another Challenge at the Critter Challenge Blog. This week's challenge is to create a school themed card or project. If you missed last weeks challenge, we have a new sponsor for the month of September! Our sponsor this month is Sew Many Cards, they have a wonderful line of digi's and online challenges every Friday. When you play along with this months challenge at the Critter Challenge Blog, you'll have a chance to win a 15 dollar gift certificate from Sew Many Cards. Remember there are No Vendor Restrictions when playing at the Critter Challenge Blog, we'd love to have you join us. I used Kitchen Sink Stamps 3 Step Letter from the Past and 3 Step School Days to create my card. I stamped the sentiment on the Red panel then embossed with a Texture Fades Folder. The White panels is also embossed with a Texture Fades Folder, then I highlighted the embossing with Pumice Stone Ink. Looking for more inspiration using this weeks challenge, head over to the Critter Blog to see what the other Designers created this week, and find out how you can play along. 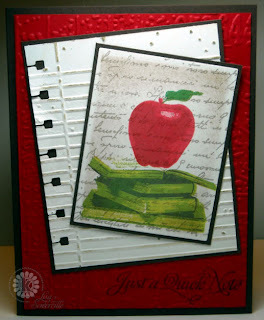 Love the lined paper background with your apples! Great design! Fabulous card! I love the embossing and the layers. Great DT card. Just beautiful!!!! Love the embossed paper! Just love all the embossed layers and the punch is perfect with the note layer, but then you knew that! Beautifully colored images! Gorgeous card! I love all of the embossing, especially the notebook paper! Awesome card, love the embossed lines on the notebook paper, great details. Great card! The embossing looks good, and I like how the images are layered. Great card Lisa-the notebook paper is perfect. Hi Lisa. I love this project. I had never seen these mulit step stamps. Very cool! I love this stamp set (especially when you're the artist). The background just makes the image pop.